This post is in continuation of my attempts started at the end of last year with path and waterbody rendering to write a bit more about OpenStreetMap map design. 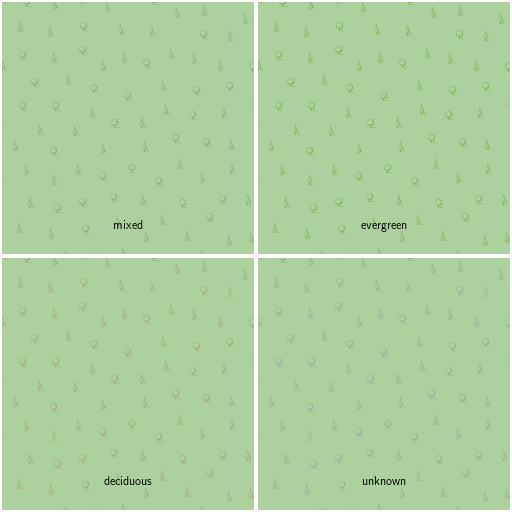 What i here want to cover is differentiated rendering of woodlands. 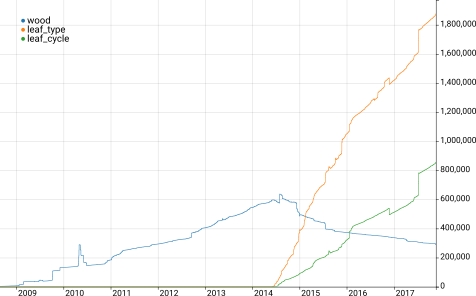 First a bit of history on the tagging and rendering of woodland in the OpenStreetMap world. 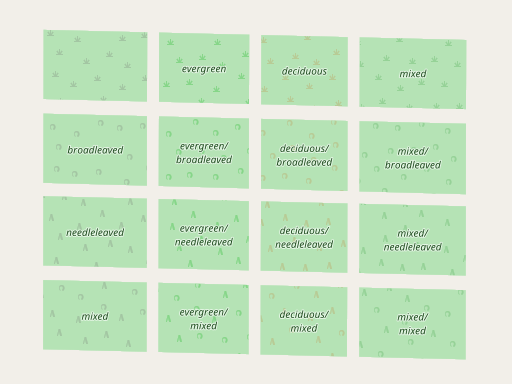 Apart from the ill-defined distinction between landuse=forest and natural=wood – on which there most likely will never be a consensus on what it means – mappers in OpenStreetMap very early started differentiating types of woodland with the wood key. Primary values were deciduous, coniferous and mixed. This was one of the most ostentatious cases of geographical bias in OpenStreetMap. The mappers who introduced this concept (from lowland areas in Central Europe) were used to coniferous trees being evergreen and broadleaved trees being deciduous. 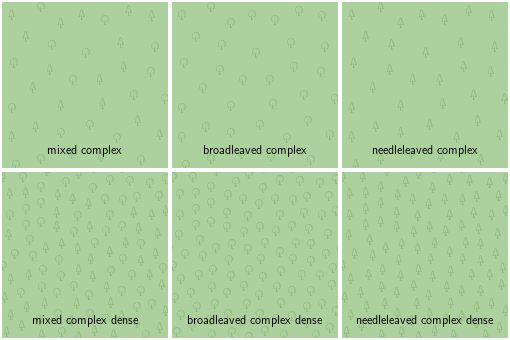 On a global level however we have all combinations of this so over time mappers realized that wood=deciduous/coniferous/mixed is not a very sensible way to classify woodlands and new keys leaf_type and leaf_cycle were introduced. These are now generally accepted. For further context on woodland depiction in maps in general Jerry wrote a nice history of woodland cartography in 2014. What i implemented in the alternative-colors style now goes back to the first major modification of woodland styling in OSM-Carto. Back then the main differentiation was still landuse=forest and natural=wood – which, even under the assumption of a consistent difference between the two tags, was too strong relative to other differences in the style. This was changed in 2015 to a unified rendering using tree pair symbols – discussion here. 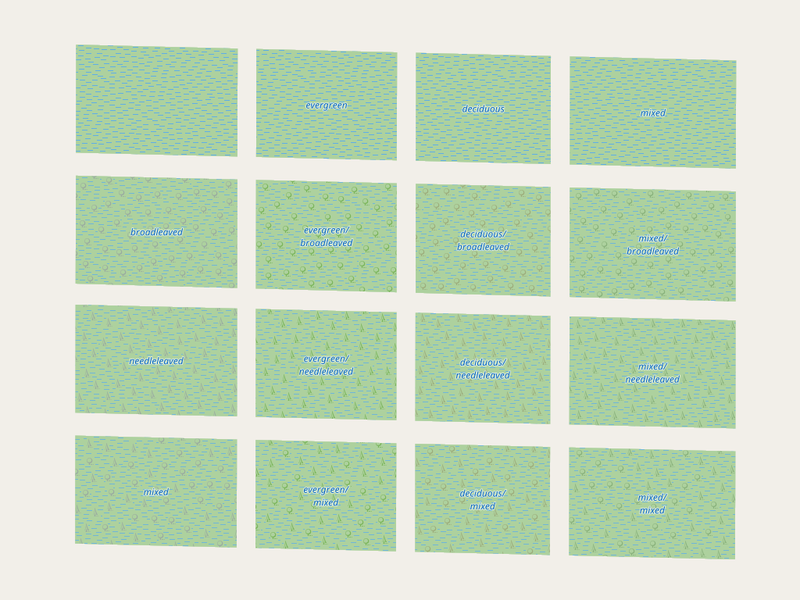 This was envisioned to be a provisonal solution until leaf_type could be differentiated – which was being done here, continuing to use the symbols from the pairs and maintaining use of the pairs for areas with no leaf_type specified. Now this design is in my eyes rather sub-optimal. The abstraction in the symbols borders to being non-intuitive (you could also see a tennis racket and cake shovel). Pattern symbols are very different from individual point feature icons, they work in very different ways for the map reader. Recognition of the individual symbol is not required to be able to read the map, it is the pattern as a whole that needs to work. This means the lack of reliable recognizability of the individual symbol does not necessarily kill this concept but on the other hand there is also no good reason for extreme geometric simplicity to ensure a very clear and sharp rendering. Instead the pattern should be harmonic with the rest of the map while being – as far as possible – intuitive to understand. Back in 2015 when woodland rendering was discussed i made a number of concept drafts for different styling ideas for woodland symbolization. The first uses the same symbol idea that was later chosen for OSM-Carto, the second is a design with a somewhat more sophisticated shape, the third is oriented at the styling used in German topographic maps and the last one is something completely different – based on the idea of a top view depiction in contrast to the profile views of trees that are used in most woodland symbols. The advantage of this is that by not using figurative symbols but a mere structure pattern – similar to the ones used for bare ground types – you in a way better avoid distracting from the other distinct signatures of point and line features in the map. The disadvantage is that you have much less possibilities to transport distinct information with the pattern. 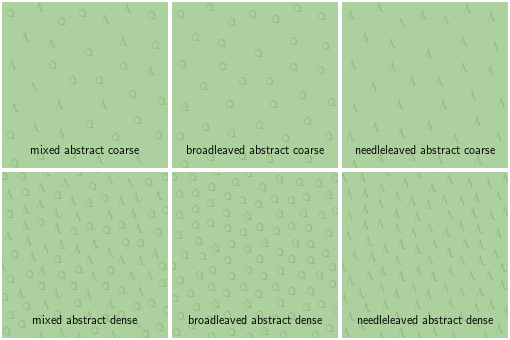 The three types – broadleaved, needleleaved and a mixture of both are about the maximum in differentiation this allows while a figurative symbol pattern would in principle allow a much larger number of different symbol types. Circles and dots – which can be considered an abstract depiction of the top view of trees – are relatively common for woodland representation. Older French topographic maps for example used this universally, newer ones only for broadleaved forests while the coniferous tree symbols are profile depictions. You can find this as well as the newer variants on the IGN Géoportail. Here a rendering borrowing from the newer French design. More abstract top view rendering of needleleaved trees can be found in Norwegian maps – here two examples – more can be found in the Kartverket historic map collection. This concept is regarding perspective somewhat similar to the one i showed above and can also be adopted in digital map rendering of course. All of this is based on the idea of two woodland types – coniferous (which as said is usually implicitly evergreen) and broadleaved (which is implicitly deciduous). But this synchronicity between leaf_type and leaf_cycle is actually not that common on a global level and leaf_cycle, that is the distinction between evergreen and deciduous woodland, is locally often the more meaningful distinction. Boreal forests are dominated by coniferous trees and the main distinction is between evergreen (spruce, fir and pine) and deciduous forest (larch). At low latitudes (tropics and subtropics) woodland habitats are dominated by broadleaved trees which are either evergreen or deciduous – loosing their leaves during dry season. In the southern hemisphere temperate zone evergreen broadleaved trees are much more common than on the northern hemisphere so the situation is different there as well. Depiction of leaf_cycle independent of leaf_type or species of tree is something very uncommon in classical cartography – largely because as already indicated separation of these two dimensions of woodland typology is not significant in many of the countries which were historically leading in cartography. 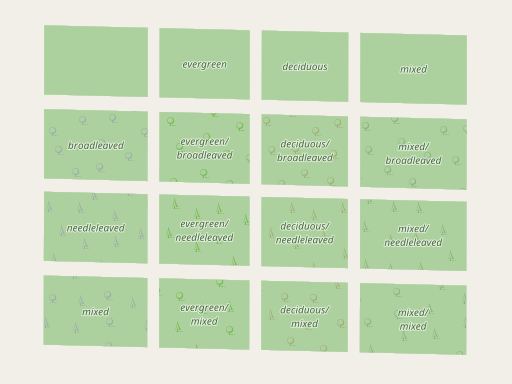 The additional problem with OpenStreetMap based maps that serve as mapper feedback is that you would not only need three classes of leaf_cycle – evergreen, deciduous and mixed, you also need a fourth unknown class. I went with using different colors for the symbols to illustrate leaf_cycle for the moment. I combined this with new, relatively traditional shapes – but this is not set in stone, i am still contemplating other ideas. Here how this looks like. 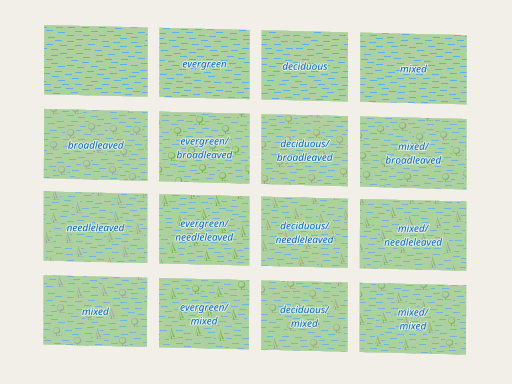 This is implemented for natural=wood/landuse=forest, natural=scrub and natural=wetland + wetland=swamp as well as natural=wetland + wetland=mangrove – the latter without differentiation since mangroves are always broadleaved and evergreen. As you can see i render unknown leaf_type for wood and swamp without symbols – not using the tree pair concept as is OSM-Carto. This means leaf_cycle is not shown if leaf_type is not tagged which is faily rare in reality. The symbols for scrub are trunk-less simplified and smaller versions of the tree symbols. 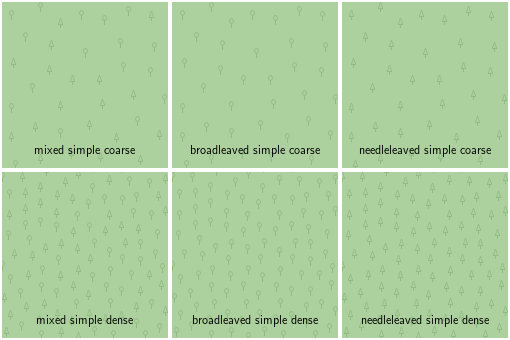 I maintained the legacy scrub symbol for areas with unspecified leaf_type. Tagging of leaf_type and especially leaf_cycle for scrub is much less common than for wood/forest and next to non-existent for swamp. Here are the numbers. 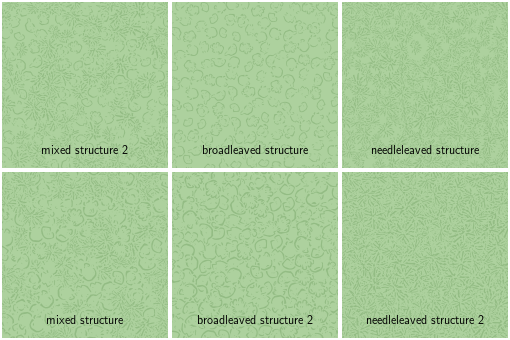 This also means further differentiation in rendering – for example showing distinct species of trees beyond the broad classification of leaf_type, is currently limited by there not being any significant volume of data that could build on. This is an interesting cartographic topic and you can find in classical paper based cartography various attempts in that direction. Likewise for the distinction between dense, closed canopy forests and open woodlands. Something for another time. The symbols used are going to be in the next version of jsdotpattern.